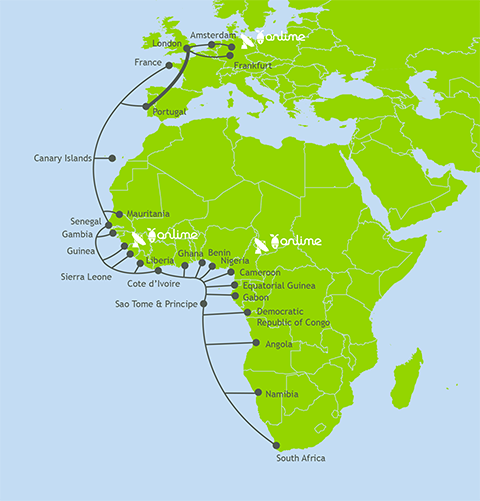 Onlime has been providing Internet to the Government and Enterprise Sector in Sierra Leone since 2005. Delivery of Internet in the country is almost exclusively by wireless and Onlime has recently up- graded its wireless network using state of the art technology to cope with the increased capacity availa- ble through the ACE bre cable to Europe. We offer a wide range of services to the business community whether you have several hundred employees or are an aspiring small business. We will work with you to provide the most suitable capacity and make sure you are online 24/7. Onlime has completely replaced its wireless network infrastructure with the latest state-of-the art technology to enable us to manage the growing demand for Internet bandwidth and data networks in Sierra Leone. Our network comprises a series of broadcast sites all around the city, providing full coverage, and we install a small modem on the outside of your offices or home which connects by wireless to our network and then by Ethernet cable. The Ethernet cable can connect to a router, switch or a single PC inside your office or home. We have added more broadcast sites in and around Freetown with redundancy at all the key locations, as we understand the critical need for our customers to be connected 24/7. Onlime was the first Internet Provider to activate services on the ACE submarine cable and we maintain fully redundant equipment at the cable Landing Station. Our backhaul links are capable of handling up huge data traffic and we are already delivering single links to customers of 100 Mbps. As part of the Onlime Group, we have the benefit of support and expertise from our technical hub in Europe and access to a growing network of fibre links around the world. We have our own dedicated POP in London Telehouse East as well as connectivity to other POPs in London, Amsterdam and Frankfurt. We also now have a dedicated fibre link to our POP in Lagos for those businesses with connections in Nigeria. Onlime is interconnected with a number of Tier 1 global Internet providers and we can provide a range of Internet products from simple IP Transit to Managed DSL and end-to-end MPLS solutions. Onlime offers a range of standard broadband packages to meet the challenges of the enterprise community in Sierra Leone. Our delivery technology is extremely flexible and for those organisations with special requirements, or larger organisations demanding dedicated high capacity bandwidth, we are happy to provide tailored solutions. We can assist with WAN optimisation to ensure Business Critical Applications operate with performance guarantees and we offer solutions to optimise the performance of your connection, using Quality of Service (QoS), so that for example, voice calls receive priority over web-browsing. The Onlime network is secure and we can add the extra security of Virtual Private Network (VPN) links if required. Our service portfolio includes the installation of fixed or wireless networks in your offices to which we can add VoIP business phone systems with low cost calling. We can provide satellite back up if required and satellite phones or remote data terminals for those out of range of the cellular networks. In short, Onlime will provide a fully managed end-to-end solution for all your communications requirements. Our existing customer base is extensive and includes a wide range of enterprise clients in every sector, large and small, and we provide the more specialised services for multi-branch banking institutions, Government Ministries and Departments, Embassies and High Commissions, UN entities, NGOs, and many more. You can log in to your Onlime Account at any time to update your contact details, check the status of your connection, your payment history and you’ll soon be able to make payments online. As part of our strong commitment to provide quality and efficient communication solutions to communities in Sierra Leone, Onlime has deployed Limezone, FREE Wi-Fi hotspots across Freetown. This is an ongoing program to expand our Wi-Fi coverage including to other cities and towns across Sierra Leone. and find out more about the packages we offer and how we can help your business.